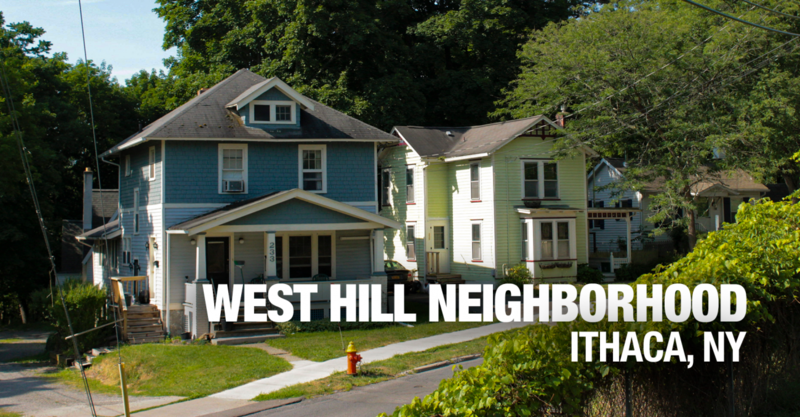 Ithaca’s West Hill apartments are part of a close-knit community. Situated across the Cayuga Lake Inlet from the city center, the West Hill neighborhood has developed a unique identity and a sense of community pride that sets it apart from Ithaca’s other neighborhoods. The West Hill area is mostly suburban, enjoying views of Cayuga Lake from its tree-lined streets. 411 Elm St. – 2 units; (2) 3BR. 513 Elm St. – Single-family home. The West Hill neighborhood starts on the west side of the Cayuga Lake inlet, and extends up the hill toward Mecklenberg. The neighborhood ends at the steep drop-off that runs parallel to Cliff Street/Route 96; to the north and the west, the neighborhood gives way to more open farm country. The West Hill neighborhood is close to the Inlet/Watefront neighborhood, and also the Southwest/Route 13 shopping area. GreenStar Natural Foods Market – Ithaca’s iconic cooperatively-owned grocery store is located just across the inlet from West Hill. GreenStar aims to make healthy, locally-grown, and organic foods available to all members of the Ithaca community. They carry a wide range of products: specialty foods, medicine, and home goods, as well as high-quality basic foods at budget prices. Inlet Island bars and restaurants – There are several long-standing Ithaca favorites just across the bridge from West Hill. The Boatyard Grill features classic American-style surf and turf dishes and a full bar, with one of the best waterfront views in town. The Dock is a laid-back neighborhood music venue that recently transformed into an arcade and billiards room, with regular special events and a deck overlooking the water. Just down the road is Kelly’s Dockside Cafe, which is open for breakfast, lunch, and dinner, seven days a week, and takes great pride in their omelettes. Island Health & Fitness – Ithaca’s state-of-the-art fitness complex is located just across the water from West Hill. Island Health & Fitness includes a spa, a physical therapy center, a full-sized pool, and plenty of exercise and cardio machines. Southwest/Route 13 Shopping Area – For residents of West Hill, the big-box stores along Route 13 are conveniently close by; options include Wegman’s, Tops, Barnes & Noble, as well as restaurants like the Texas Roadhouse and Applebee’s.